A 1 day workshop that will give you the tools, insights, and confidence to manage programmers and programming teams effectively. Learn how to help turbocharge your career and deliver outstanding results for your company! 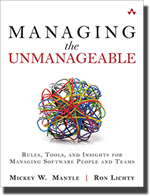 This one-day master workshop will be presented by Mickey Mantle and Ron Lichty, the authors of the book Managing the Unmanageable published by Addison-Wesley and recommended as one of the top three books that every programming manager should have on their bookshelf. All workshop attendees will receive a copy for their continued reference and bookshelf. Now for the first time, learn directly from the authors of this book who have distilled the most important information in the book and created this workshop for software development managers, software team leads, programmers who aspire to become managers, project managers, and those who manage departments of programmers – as well as other Managers, Directors, or C-level executives who rely on programmers to deliver projects that are critical to their organization’s success and want to learn more about how to manage programmers successfully.